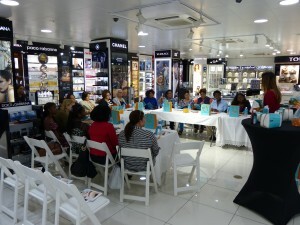 WILLEMSTAD – The ladies were having a blast during the Moroccanoil Workshop organized by the Yellow House at their beautiful store in Saliña. The workshop was truly a success. The Yellow House invited a few of its clients to attend the workshop where Viviana Garrido gave a presentation on the products offered by Moroccan Oil. Garrido is the area manager for the Caribbean. Moroccanoil's story began when co-founder Carmen Tal was traveling in Israel. She had her hair coloured, but the process left her hair badly damaged. A friend took Tal to a salon, where Tal experienced a restorative hair oil treatment for the first time. Tal loved the transformation of her hair from damaged, dry, and lifeless to shiny, smooth, and manageable. Inspired by the results, Tal set out to research the unique benefits of various oils on the hair. At the time, oil was not a popular ingredient in hair treatments, but Tal and her husband teamed up with a group of visionaries to perfect an amazing formula: Moroccanoil. Moroccanoil contains a proprietary blend of argan oil that is rich in vitamins A, E, and F (omega-6) to improve elasticity and provide powerful antioxidant protection. The one-of-a-kind hair treatment also contains UVprotectors and phenols to shield against environmental stressors. 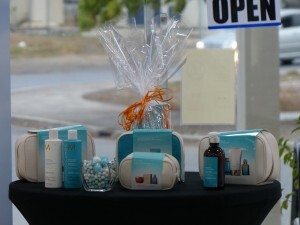 As a pioneer in hair care oil, the original treatment of the Moroccanoil has caused a worldwide buzz with the argan oil. Moroccanoil contains an extensive line of products for hair care which covers all types of hairs. This is very important since there is a great diversity on the island. This was so visible during the workshop at The Yellow House. Every women present had a different type of hair. Visit The Yellow House for more information on this amazing product.